Well. There you go. 50 hours on a train. The only thing i can say is, I guess, I’d rather 50 hours on a train over a bus or plane any day! It’s been a marathon experience which began back on Friday afternoon leaving Irkutsk shortly after 4pm. It’s a journey that not only tool over two full days, but saw the train and its passengers pass through three separate time zones. When I arrived at the station in Irkutsk the queue waiting to be let onto the platforms was huge, all sort of clumped in a group at the top of the steps. I was 50 minutes early, and we stayed locked out of the platform area until around 30 minutes to go. Imagine my surprise when I realised – this WAS the trans-Mongolian Express, the very same train I had taken from Beijing to Ulaan Baatar! Well, not physically, that train would be heading back as the journey takes the best part of a week, but it was the K3 second version. It had two Russian carriages tacked on to the back, and it was the very last carriage that was mine. I survived the first night with only one other in my four bed compartment, but we were joined early on the second day at Krasnoyarsk by two others. 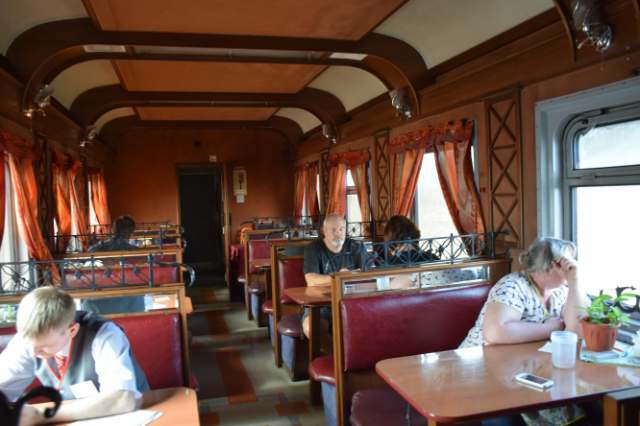 The best news about this journey, unlike the previous one, there was a restaurant car. 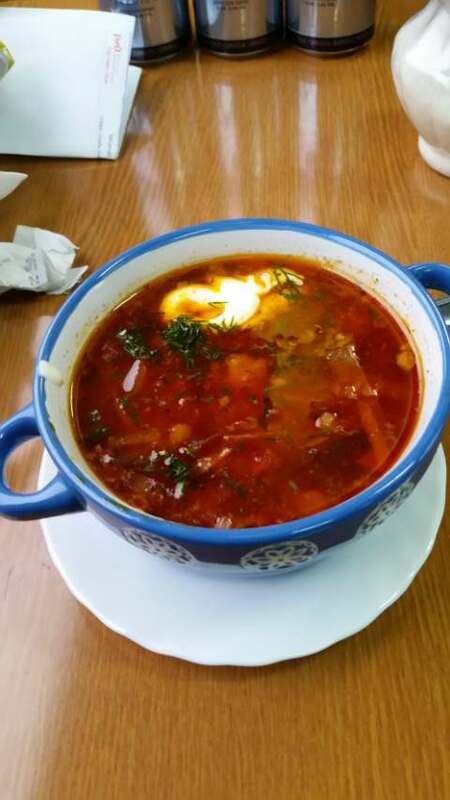 I had borscht and a beef stew with lots of potatoes and the was really nice, certainly better than that on the Beijing to Ulaan to Baatar leg. 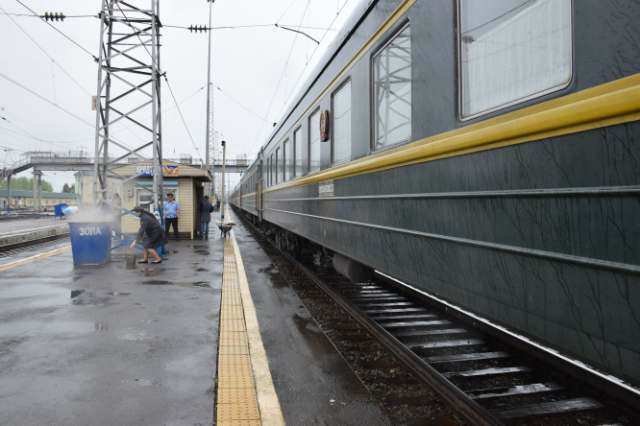 This would be the third restaurant carriage this train has had, changing in Russia and Mongolia. Apart from on the Chinese leg, the meals have not been complimentary. Unexpectedly, this journey has shown us less villages and towns than the previous one. 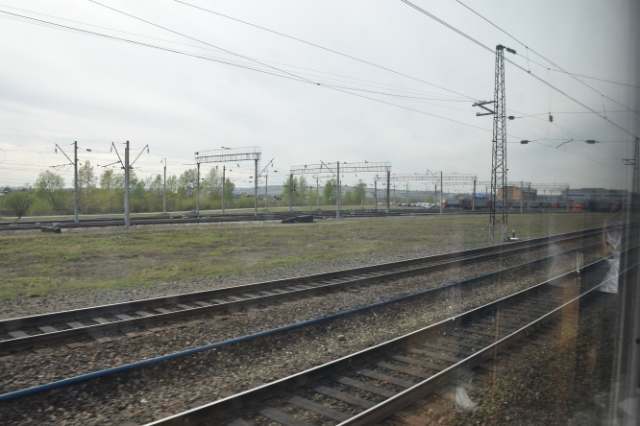 As we continued westward through Siberia the scenery was really very beautiful, if also very ‘samey’ with green the colour of the trip, loads of grass and trees. For some reason the trees here all seem to be tall but thin. I wonder if that’s because of the lack of sunlight and being smothered in snow for half the year. The first main stop was Zima, which didn’t seem to be up to much. 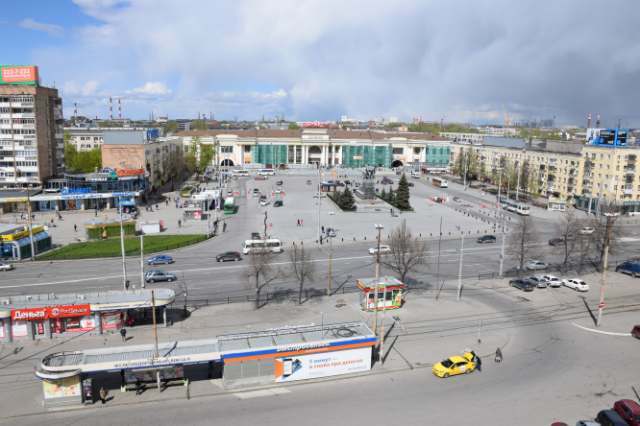 Then the first morning (second day) Krasnoyarsk, which saw us take a few people on board. We woke with the first time zone change – my phone had worked it out. Then onwards into the day, past trees, trees and more trees. 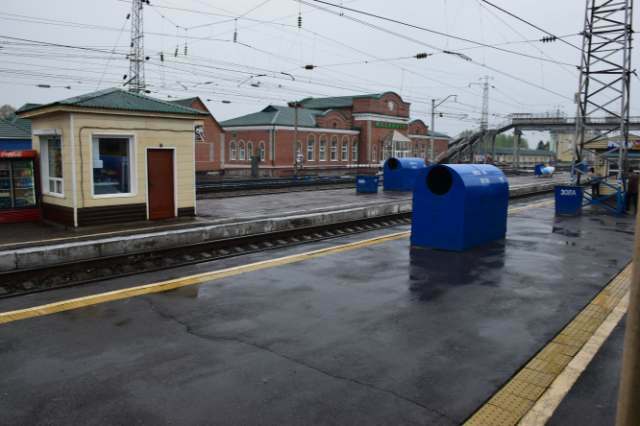 Around lunch it was a 22 minute stop in the town of Mariinsk, where it was raining and I ducked out across the tracks to get some yummy biscuits from the little stall on the adjacent platform. Novosibirsk arrived in the early evening, and I said ‘goodbye’ to Nicole and Stewart, companions on the last two rail journeys, from Australia. It was great to have people to pass the time with, especially on this journey as my cabin mates had all kept to themselves for the duration. My cabin of four bunks was full at this point, picking up two people in morning at Krasnoyarsk, after a night with just two in the cabin. The next morning – earlier today, and I awoke to sunshine. My two newish roomates were replaced by two new ones at around 3 or 4am in the middle of the night. There was a little kerfuffle as the first lot had to get ready to alight and strip the beds, and then the next two had to make there beds. The train trundled on into the night. I couldn’t be sure what the time actuially was. My phone is on roaming and the time zone changed over the first night, but on the second morning the time remained the same still, even though the ‘trusty guidebook’ had said that at Novosibirsk we should have set the clocks back another hour. Perhaps since it was written some time zones may have been have combined? That was pretty much the only theory I had on the matter. The sun came up on Sunday morning and for the first time at any time I have ever been in Russia, there was not a single cloud in the sky. Not one! We stopped at Tyuman at around half past ten. That would be 630am Moscow time, which I decided to stick to as the timetable on the train is on. The cabin went from four to three passangers, and I was slowly approaching the end of my epic train ride, due in Yekanteringburg at 1130am Moscow time! Borscht fit for a King! I packed early and headed to the restaurant car, where I had spent many an hour of this long journey, and sat down for a bowl of borscht. Really, it’s delicious! The restaurant carriage here is excellent. Clouds, by this time, had covered 75% of the sky, so the clear sky was short-lived. Still, sun broke through. We passed the occasional town, and at times it was quite an industrial area, and then it was back to green forests, and the occasional farmer. That must be a near impossible profession in Russia, the winter lasts so long there’s only a few months a year you could grow stuff. Yekanteringburg station from my hotel room. Yekanteringburg finally arrived. It was cool but not too bad. I wore shorts the whole journey and actually, I give that the thumbs up because honestly, the train is kept pretty hot the whole time. Journey over, I was lucky enough to have a hotel directly opposite the station. Which meant it was time for an overdue shower and shave. Thanks for reading, will let you know about Yekanteringburg next post! Oh, and naturally, May the Journey Never End! Next Ekanterinburg. Yekanteringburg. However You Spell It! Wow, 50 hours. I had to google Yekanteringburg…you’re really in remote territory. Enjoy the rest of the trip, looks like a real adventure. it surprisingly didn’t feel nearly that long! Thanks for reading! I want borscht on the Trans-Mongolian Express too!! That looks delicious!! I think it must be an essential part of the experience Tim!